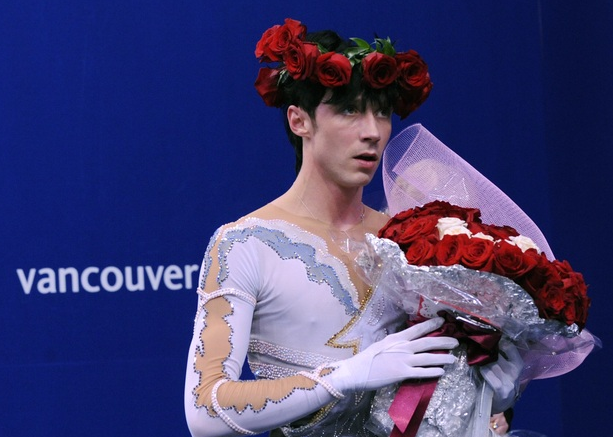 You are here: Home / TSF Content / fashion & style / in vancouver, plushenko’s outfit did him in? Weir crowned himself with some roses after his performance. Appropriate for Mr. Best Dressed. Plushenko faltered. Or, did he? Controversy has begun to swirl around Lysacek’s upset. Lysacek’s two-piece outfit looked great on his fit form, but the different shades of black didn’t bode well for him. Nor did those snakes. Oh, the snakes! Bronze medalist Daisuke Takahashi‘s outfit had plenty going on. We especially like the plaid, ruffled neckline and his Weir-inspired hair. 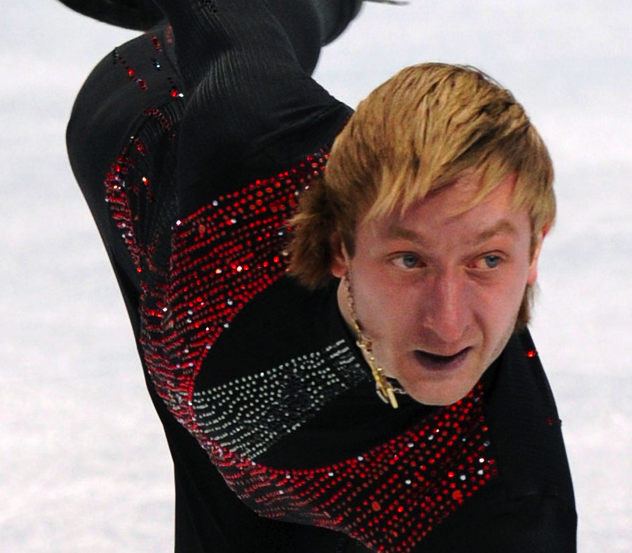 Plushenko is the best skater of all time. He is simply the best better than all the rest. He was robbed of the gold. Evan though Lysacek did a good program he did not do a quad, both skaters did 11 jumps and with Plushenko’s quad toe-loop he should have had more points as he was ahead. He was poorly judged on his Quad Toe. And for artistry Plushenko is more intricate and emotional than anyone else. Plushenko’s foot work was far more intricate than Lysacek. The first quad was done in 1988 by Kurt Browning this is 22 years ago and now we have an Olympic champion who didn’t attempt it, think about it? Johnny weir was also poorly judged he should have had the bronze. He should have been ranked fourth after the short program as his programs were amazing and clean, I thought his long was far better than Lysacek’s. But then again he speaks his mind and he is controversial so of course he would not be marked fairly. Elvis Stojko knows what he’s talking about, at least he can land a quad unlike Lysacek. But then again im sure Plushenko will invent a new quad maybe a quad axel. Because he is the best and at least is allowing the sport to progress than be left behind. @gilly – Wow! Elvis Stojko? If he’s so intent on scoring and ranking the field, maybe he should pursue a career in judging? Then maybe I’ll care. In the meantime, face it…of course Elvis loves Evgeni, they have so much in common. The now infamous “quad”, and more importantly, THE MULLET. Granted, when Elvis sported it, it wasn’t quite as horrifying (although the flashback I’m experiencing at the moment is terrifying). However, the “hair-don’t” on top of the head of this year’s SILVER medalist is a) poorly executed, b) completely unflattering, and c) just distracting. Call it what you want…”Business in the front, party in the back”, or “The Achy Breaky Big Mistake-y”…it really must go. Sorry, but I cannot take anyone seriously that is definitely worthy of a Gold Medal in Whining, but does so with haircut that would get someone fired from “Great Clips”. And where is his Mother? One look from me and my children wouldn’t dream of acting like a complete idiot. We don’t “do” whining here. The hair would NEVER happen either, but it only proves “you can’t buy taste”…however, you can use that money to get a decent haircut by a real hair stylist. And a real stylist would refuse to give him that haircut even if he insisted. In all fairness, I will say that I do find Evan’s hair distracting as well. Where did he find my Mother’s patented “Dippity-Do & Aqua-Net Ultra Hold” combo? Thankfully I have a DVR so I can watch it over and over again when I realize I’ve been waiting to see if the hair moved, rather than the skating. (Don’t get me going on the spray tan, k?). Elvis Stojko didn’t think Evan should have won. He places him third. I don’t know jack about figure skating, but even I noticed that Plushenko was kinda wobbly trying to land his jumps. Good for Lysacek. I did expect Weir’s score to be higher, though. Personally, I’m really happy Takahashi got a medal. With 3 Japanese men in the final 8, and no man from there ever winning a medal in the category before, it would’ve been a shame. Weir is a complete POS who wasn’t good enough to medal. Fitting.